Sumati Mishra of Nawapara in Surguja district of Chhattisgarh lost her husband long ago. The challenge before her was to run her family and to raise her children. She has two daughters and one son. To manage her family she started working hard. For ten years she span yarns but it did not give her significant profit. Sometimes she would not get any profit and therefore it made her nervous about her future. “I used to work for the whole day but it was not very profitable. Then I started making Papads but it did not give me much profit either. At that time someone told me about mushroom cultivation and that there is the scope of training in mushroom cultivation in Ambikapur itself. SO I went straight to the Horticulture department and met Dr. Prashant Sharma of the Biotech lab. It was the turning point for me.” She says. Meeting Dr. Sharma was indeed a turning point as he told her how to proceed with mushroom cultivation. She got training in the biotech lab. After completing her training she started mushroom cultivation. Mushroom cultivation has been traditionally popular in the Surguja district and it is a popular food too. Since Mushroom is a great source of protein and other nutrients, it is often described as a super food. Capitalizing on this, the Surguja district administration has taken steps to turn mushroom cultivation into a profitable venture. The farmers doing mushroom cultivation are being provided spawns as well as technical knowledge. The administration has also set up mushroom production units and procurement centers. The farmers can sell their produce in these procurement centres for a good price. A processing unit has also been set up at the biotech lab and various mushroom related products are being processed there. All these steps are taken to encourage and support mushroom farmers. The administration is also planning to associate mushrooms with the mid-day meal scheme in the schools. 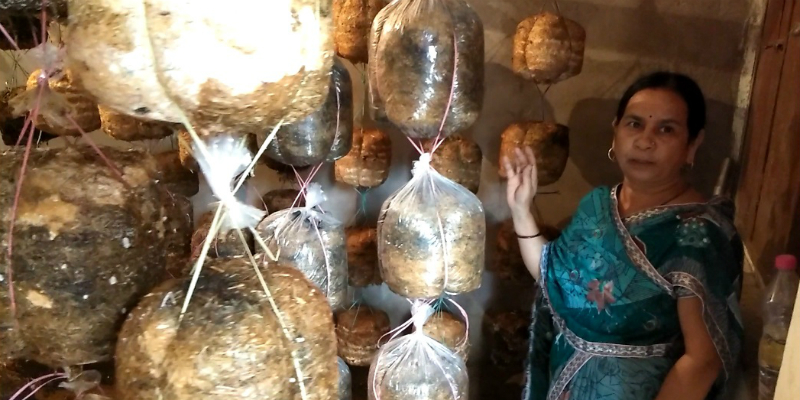 With so much emphasis on mushroom cultivation, Sumati did not have to worry about selling her produce. All her mushrooms were bought from her home itself. “I started to earn good amount of money and I expanded my activities. Initially I did mushroom cultivation at one place and then I started doing it in another place too. I am getting a good amount of money and I am able to support my family without any headache.” She says. Sumati has been able to support the education of her children and has also married off her eldest daughter with money made from mushroom cultivation. She has also won a few awards for and recognition for the work she has done with mushroom cultivation. “Mushroom cultivation has been the lifeline of my family. I am planning to expand it further. My younger daughter helps me with my work and she is very excited about the prospects of mushroom cultivation.” She says. Sumati is grateful to Dr. Prashant Sharma of the biotech lab and the district administration in general for the support she has got. “Without their support it would have never been possible for me” She says.